boy. not much of a' jazz mod' to just add a 470n cap before the 22u output cap, but you did a really nice job shrinking it down by two columns and only adding one row. I liked that big bloom better. That thread at fsb is hilarious. has anyone found a schematic or layout of love pedal high gain tweed twin?i really really want to findout whats in it. There's a 9/10 chance the High Powered Tweed Twin is little more than a mode on the Les Lius. I wouldn't be surprised if that's what it is. So with this, if we figure out a way to add a cab sim out...we have something close to an Ethos overdrive?! Well a D pedal into a cab sim will at least get you some of the way there, but the Ethos is very much more complex beast and on a different level to this altogether. It's one of the few boutique pedals that I think deserves the price. One thing is for sure, we'll never be doing a vero layout for it, I don't think I'd even want to build one on PCB. Shame there is a waiting list and we end up paying a massive premium to import to the UK (or for a UK dealer to take a ridiculous cut), or I'd buy one. I built this one and it definitely works but I think that the transistors might be sensitive because mine doesn't sound like it should.. its got a tiny bit of fizz and the gain comes on super strong at about 10 o'clock. I bought several of the transistors from tayda so they probably have all of the same (wrong) gain range. any ideas of how to remedy this problem? Thanks. Hey IVIark, when I'm getting a fizz like described above after building a pedal, is it always because of the IC? Or is that just the case for this particular pedal? Thanks for adding so much to the DIY community. I've now also tried tl072 , lm833 and ne5532. Some of them I have multiples of and tried all of them . I have 1458's coming in the post I'll try them too.The 5532 were actually one of the better ones , but still it's annoying because it has a good base tone I could use but the fizz is too much so far.I also tried with a 150k and 470k impedance and not too much difference with my gear. Yes it has to be expected when we know the opamp is going to be doing the clipping rather than diodes. It really is just a case of trying a few and selecting the one with the least fizz, John K mentioned that the MC33172 sounded best in his. One other alternative that may appeal to some people is to put 2 anti-parallel diodes between pins 1 and 2 so the clipping is coming from diodes instead of the opamp. It may be even closer to a Tubescreamer then but if it improves your pedal then why not do it? I may add a modded layout for it actually. funny, that added pair of diodes was one of the first mods I did to mine, and it did help with curing most of the fizz, but once I installed the MC33172 chip, I no longer needed them so I removed them. Where did you get your MC33172 from John? They seem expensive on eBay and so wondered if there was a good source elsewhere. I got them from Mouser (back when I was building the Seamoon Funk machine) but it appears that they no longer stock them - bummer! looks like they're available and super cheap on your side of the pond but you have to buy a minimum of 50! Ooh excellent, thanks for the link. I'll get some from them I think, I just need to get the order up to £30 to avoid a handling charge so I'll have a root around and find something else to buy. Just finish but tone and accent never working. Only one thing I don't have the opa2134 and i tried LM833N and sound like that. With 4558 and tl02 never sound.. Sounds like you may have a poor connection at your IC socket. Use the diode tester mode on your multimeter to check the front springs and rear soldering are connecting properly. A couple of times on here a faulty build has been down to a break between connector and post in the socket. I've checked three times all rear soldering and changed the socket, but nothing, also I've found a ops 2134 and with this one never sounding at all!! Only one thing that I have different of original TOC is the two BC548 instead of BC548B.. It's no problem using those transistors, so that isn't your problem. But as usual with these things to be able to offer any advice you really need to post all transistor and IC pin voltages so we can see what area seems to be the problem. Q1 collector is 9V which is expected so that is ok. There must be a problem somewhere with the list above, and if that is corrected the other voltages later in the circuit may also be corrected, so that could potentially fix everything. But you're going to have to go over it extremely carefully to check everything is correct as per the layout. Also check for unwanted bridges around your soldering, check that all cuts are clean and no copper is left which may be causing a short, and of course check all soldering for cold joints. Sorry I have inverted 5 with 8 pin and so the 2nd row. Ok meanwhile I try to find the error.. These are the pics of my effect, I never found anything but still never work! Have a look here: Fault finding a build. Go through the sections and if you're still having no luck post here again with the required info mentioned in number 6. Where have you posted your voltages? Well most of them look wrong, and it suggests to me you have a problem with your reference voltage. Check the voltage on the second row from bottom, it should be half your supply voltage and so around 4.5V. If it isn't 4.5V then you need to check values and soldering of the two 10K resistors connecting to that row from IC pin 4 (ground) and IC pin 8 (9V). I think you may find a short around there or maybe a bad solder joint. Voltages on the bases and emitters are too high now. If the voltages at the transistors are exactly the same, then are you sure the cuts are complete on the base and emitter rows? Re-do the cuts to make sure. Also reflow the solder on the link connecting all the ground rows together. I four the error! 2nd row from bottom have a wrong link with the ground! The pedal now sound perfectly! Hi guys, first up: Thanks a lot for these layouts, Mark! I got one question regarding the second version with the added clipping diodes. Your last sentence says: "Or if you want both options just build the original and add the diodes on a switch between pins 1 and 2." A DPDT switch would be neater because you can solder the diodes across the poles. 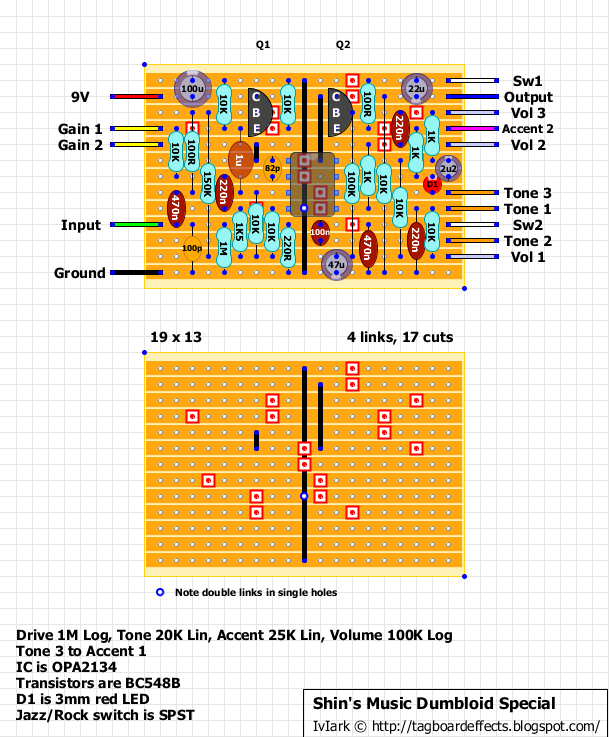 Look at the recent layout for the Mesa Boogie Grid Slammer, add that switch (you could even include the Timmy clipping option to to make the most of the switch) and get your feed to the switch by connecting lugs 2 and 5 of the switch to pins 1 and 2 of the opamp. If you use a DPDT on/off/on you'll have Timmy clipping in one position, Tubescreamer clipping in the other, and original Dumbloid in the centre off position. Hi, I might be a little thick here. but there only seems to be one wire connected to the accent pot. Is this correct? Many thanks. I was being thick. I'm really new to pedal building and hope that someone can help. I am building the Dumbloid Special and tone 3 goes to accent 1. In the diagram there is only accent 2. Can someone please share pictures of their working build including all wiring to the switch with diodes as well as all wiring to the pots? Your help would be greatly appreciated. If you look at the offboard wiring page http://tagboardeffects.blogspot.co.uk/2012/02/offboard-wiring.html there is a little picture which shows the numbering of the pot pins. I'm currently making this pedal on a stripboard but I'd like to develop a board. does anybody have a schematic of this? Thanks |v|ark, I've found it. I was giving consideration to make my own PCB as I cannot get this to work. This is my first stripboard project. I made 2 pedals from printed/developed PCB few years ago. After cutting the board I've tested all tracks for shorts and it was OK. I've checked each componenet before soldering with multimeter it seemed OK. I've retested the board for shorts after soldering and it also seemed OK. When I connect guitar the only thing I hear is buzz which gets louder when I crank the volume pot. I've been trying this for 2 days straight and still cannot get it to work. Well you have 9V on pin 4 where it should be 0V, and 0V on pin 8 where you should have 9V. So to me it looks like you've reversed the supply leads. Thanks |v|ark for fast reply. I appreciate it. Well, i had to take a rest before I checked it again. I was giving the votages measuring from the positive pole of battery and did not invert them before writing it here. Turns out that I've soldered Q1 1 track down. Reseoldered it and I got the output working. The only thing now is that it seems that only pot that has any influence on sound is gain pot. All the others don't do anything. I'll give it another check this night or tomorrow. Just to thank you for the layout and the assistance. I've managed to find time and debug/complete the pedal. Sounds great. Images are here: http://goo.gl/RzrOvz will try to make video also. I've completed this mostly from the parts laying at home and what i could purchase locally. I was not satisfied with quality some parts, mostly connectors, so I have ordered kit from BitsBox and I'm planning to make a second one with printed PCB. Pins 2, 3 and 6 (6 shown as 7 in your post) are too low so check all connections around there and see if anything is amiss. Check soldering and cuts between pins. still sounds very fizzy and im getting squeling when gain is at about 50%. You are showing 9V on the ground pin (4) and 0V on the supply pin (8). Those are very much the wrong way round. Have you mixed up the wiring from the supply adapter? Hello, everyone! I'm a complete beginner when it comes to electronics. Nevertheless, I jumped right into making this pedal. As I don't have a clue to what I'm doing, it didn't turn out the way I hoped it would. The volume is quite low when I turn the pedal on. The gain seems to be on full constantly. The gain pot acts as a volume pot. The tone pot and the volume pot both act as tone pots. I compared my work with the illustrations over and over, but I can't see what's wrong. Do any of you experts have any ideas to what I've done wrong, apart form attempting to build this thing in the first place? A description could never tell us enough to offer any real advice. Measure the DC voltage between all IC and transistor pins and ground, and that will give us a good idea where your problem areas are. Would a TLC2262CP work? I used one in my Zen Drive and its awesome. This is my second build and with no clipping diodes fitted the sound seems boosted but very clean. I did notice one variation between the supplied kit and the schematic. The kit has a 1k8 resistor, and the schematic shows a 1k5. Would this make a noticeable difference please ? any idea of the boost that used on model B? Hey, pretty new to this and just have a simple question. 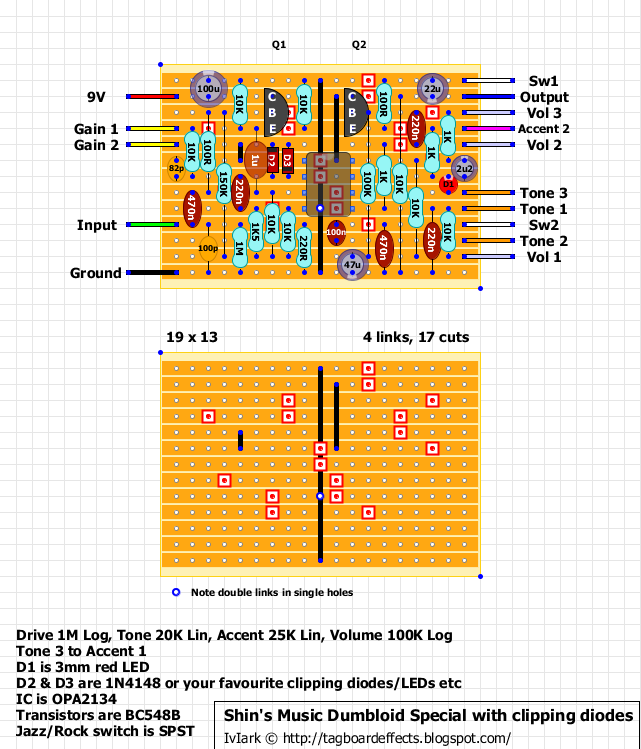 I wanted to build the pedal without the diodes, but I followed the second schematic (which includes the diodes) and just didn't put the diodes in. Are the first and second layouts essentially the same, just with a capacitor and jumper reorganized to leave more room for the diodes? Or does the changed position of these two components effect the circuit? Thanks. first off welcome. second, yes the layouts are both identical, and spot on with the exception of the diodes, and the movement of the link and 82pF cap which was done to make room for the diodes. if you put sockets in place where the diodes are you can see how it sounds with and without diodes. you may like both options and want to put the diodes on a switch so you can choose either option with the flick of a switch. side note, any of the boards you see here are layouts not schematics. schematics show the main form and features of circuit in the form of a drawing. the layout is the actual laying out of the components to create the circuit. the only reason i'm point this out is that using the right lingo helps make discussions clearer and easier. Awesome, thanks for the prompt response. I had a feeling "schematic" wasn't the right word, but didn't know what else to call it. Thanks for the info! I'll definitely try a socket for the diodes. Anytime man. Glad to help. Hey, just finished up and getting loud popping when the pedal is switched on or off. Any ideas or usual suspects? Thanks. Measure voltage at input and output pot's log 3. If you have a DC voltage leaking there from somewhere, that could be the cause for your symptom. Not exactly sure what that means! But I'll look it up and figure it out. Thanks. Also maybe something else is going on with the pedal. Is it normal for the Tone knob to not really have much of an effect if the accent is all the way down. The tone seems to only interact with accent and otherwise seems to not have much of an effect if any. Whoops, I said that backwards, the Accent knob doesn't seem to have any effect when the tone is turned down. Hi Mark, I'm thinking of building this with a switch for the clipping diodes. Could I use a DPDT on-off-on and run wires from the onboard diode locations to the toggle to get a original/TS switch? Anyone else having problems with this build? Ive built several times and just get an overblown gated fuzz. I just build this. With OPA2134PA and without the extra diodes, no fizzyness at all, sounds rather good. I didn't have 3mm red diode, put 5mm red diode instead (if it matters). I first connected all pots wrong way (lug 1 was 3 and lug 3 was 1) and got this horrible fizziness. So be sure you have them right way. I used Alpha 20k W-taper as Tone pot, works fine. Granted in extreme settings you will get serious distortion. Thank you!